The preparation of a weather forecast covers a wide range activities – observations, communications, analysis, prediction, and dissemination. These are all essential components of a weather forecast service. To prepare a weather forecast, a meteorologist must first obtain a detailed picture of present weather conditions over a specific region. This requires routine and accurate measurements of the lower and upper atmosphere collected or observed at ground and upper air stations and from remote sensing systems. Accurate observations of the current weather are the basis of a good weather forecast. Meteorological observations on land, at sea and in the atmosphere are made and exchanged internationally every day (Image credit: COMET). The natural forces that drive the weather do not recognise national boundaries. Therefore meteorological observations spanning countries and continents are required. International data exchange underpins operational weather forecasting – MSS routinely exchange data with other meteorological centres around the world through a dedicated global telecommunications system. The vast amount of meteorological observations over a large region are plotted on a map, with different symbols representing wind, temperature, cloud and other components that make up the weather. The meteorologist can thus quickly identify all the weather elements at a certain location, analyse the wind patterns and locate significant weather systems such as storms. Charts are prepared for the surface and different upper levels of the atmosphere to give a three-dimensional picture of the weather situation. Temperature profiles are also plotted from upper air data so that the vertical stability of the atmosphere can be assessed. 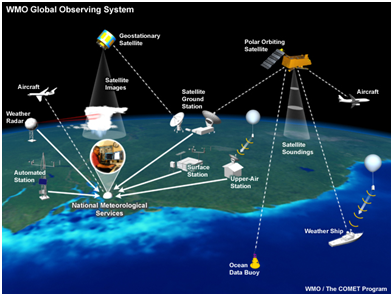 Observation data is used as inputs to numerical weather prediction (NWP) models. These computer models incorporate complex mathematical equations representing well-established physical laws to predict the behaviour of the atmosphere. In the model, the atmosphere is divided into many “blocks” of finite size, 20 km across and a few hundred metres high for a global weather forecast, and 2 km across for a local weather forecast for a single country. The solution of the equations proceeds in time-steps of a few minutes, until the required length of forecast (the lead time) has been reached. This requires very fast high-performance computers to carry out the enormous number of calculations required. The final products are predictions of wind, temperature, humidity, rainfall and other meteorological elements. Forecast of surface wind is one of many types of meteorological elements produced by a Numerical Weather Prediction model. The NWP approach is not perfect as the equations used to simulate the atmosphere are not precise. The initial state of the atmosphere is also not completely known, as there are many observations gaps especially over the oceans and remote areas. Nonetheless, NWP is the best approach at forecasting day-to-day weather changes. Forecasts from NWP models have shown significant improvements over the years in terms of accuracy and lead time. The models have high skills in the mid-latitudes where the weather systems tend to be large scale; however they have relatively low skills in predicting transient, small-scale systems such as localised thunderstorms which are common in the tropical regions. Using data analyses, NWP model products, radar and satellite images, climatology of the area and personal experience, the meteorologist prepares the forecast of how the weather would change in the next few hours and days. Deadlines have to be made for the media, airline flights and many other user sectors of daily weather information. Tropical weather is difficult to forecast compared to mid-latitude weather. Unlike the mid-latitudes, the tropics have a relatively homogenous air mass and fairly uniform distribution of surface temperature and air pressure. Therefore local and mesoscale effects (e.g. sea breezes) are more dominant than synoptic (large-scale) influences, except for tropical cyclones. 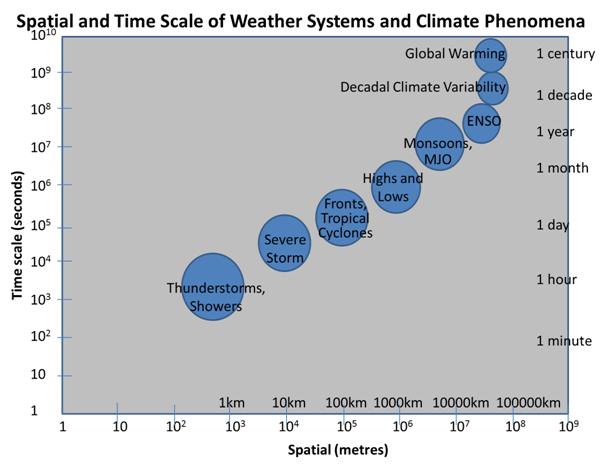 The different spatial and time scales of weather systems and climate phenomena pose varying degrees of forecasting challenges. Strong convection and moist air in the tropics gives rise to frequent development of rain showers and heavy thunderstorms. These convective weather systems tend to develop and dissipate quickly, often within one or two hours. Also, as the prevailing winds in the tropics are generally light, predicting the movement of localised storms can be difficult. Their short lifespan and small size presents a forecasting challenge in terms of accuracy and lead time. Current NWP models have low skills in predicting tropical convection, and the complex dynamical processes that influence weather and climate in the tropics is still poorly understood. This is an important area of research that is being undertaken at the Centre for Climate Research Singapore (CCRS) and other research centres around the world. a) Rain Steady water droplets that fall from stratiform or layer clouds. Tends to affect a wide area, and is more persistent than showers. and usually localised over an area. suitable conditions can produce waterspoutsnd/or hail. d) Cloudy Between 5 eighths and 7 eighths of the sky is covered by clouds. • Heavy Rain/showers falling in sheets with misty spray over hard surfaces. • Occasional Rain or showers occurring at irregular, infrequent intervals. • One or two areas :  Small, localised part of a Region of Singapore affected by rain/showers. • Many areas Large parts of more than two Regions of Singapore affected by rain/showers. • Widespread: Almost all parts or whole of Singapore affected by rain/showers. Time Descriptor Period Map shows the 5 regions of Singapore. “One or two areas” is used only in conjunction with 1 or 2 Regions of Spore (e.g. western Spore) when a localised part of the region is affected. Not applicable for “many areas”.